The American College of Prosthodontists, experts in tooth replacement options, states that approximately 178 million people in the United States are missing at least one permanent tooth. That’s a lot of teeth and a lot of impact on smile aesthetics and oral function. To help reduce that startling statistic, the dentists at Brooks Dental in Boston offer modern dental implants, bridgework and dentures to help people have fully functional, attractive smiles they can be proud of. Howard Brooks DMD and his professional colleagues at Brooks Dental PC help patients determine which prosthetics are best for their particular situation. With a decision made, the team provides superior restorative work for smiles with optimal look, feel and function. There are many good reasons to replace even one tooth. One of the most important is keeping teeth which border the empty tooth socket well-aligned and strong. Without a tooth replacement, adjacent teeth weaken and drift, creating unsightly spaces. Another reason is gum and bone recession. Without natural tooth roots to provide adequate pressure and exercise, gum tissue and its underlying jaw bone deteriorate. Facial muscles sag, and skin wrinkles, particularly with loss of multiple or all teeth. Speech and nutrition suffer, too. If you are missing teeth or face extraction, don’t despair because the team at Brooks Dental can help. When you come for a consultation, your dentist will examine your mouth and take digital X-rays or a three-dimensional Cone Beam scan as needed. This information aids in formulation of a treatment plan just right for your oral health and appearance.The dentist will offer solutions to your tooth loss. Dental bridges in Boston are a common and reliable choice. Made from lifelike porcelain and other biocompatible materials, bridges replace one or more teeth a row. Typically, the artificial teeth anchor to natural teeth with porcelain crowns. Full or partial dentures take care of more substantial tooth loss. The partial denture is composed of one or more artificial teeth, or pontics, mounted on a light metal frame. The partial affixes to natural neighbors with metal clasps. Conventional full dentures are composed of acrylic. Traditionally, they are secured by the mouth’s natural suction. 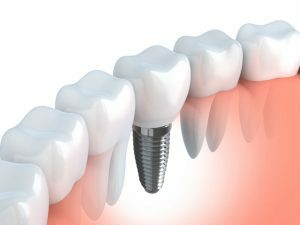 Dental implants in Boston are the most stable and long-lasting tooth replacement. Placed during in-office oral surgery, titanium dental implants replace one or more teeth or even an entire arch. Implants are more than 95 percent successful as they reside in the patient’s jawbone, melding to it through osseointegration. Contrasted with traditional bridges and dentures, single tooth implants or implant supported dentures or bridgework last for decades when patients are careful with their oral hygiene habits. Please contact Brooks Dental PC for your restorative dentistry consultation. Dr. Brooks and his team would love to help you have the healthy, bright smile you deserve.